I heard about this probably a year ago or longer. The concept is far from new and has appeared in many halachic issues. For example: Dinei Yichud (being alone with someone of the opposite gender (or indeed same gender for someone who is Gay!). First, an admission. In our family, we only drink mashgiach supervised Chalav Yisrael. Ditto for milk products, with the exception of a chocolate bar that is known to be from Milk powder (see Rav Frank in Har Tzvi, which is also accepted as normative in Israel by the Rabbinate). The reason my family does this now is because I did it for about 7 years before I got married. Why did it I do it then? It wasn’t because I was a frumak who had returned from learning overseas and overturned his parent’s house and insisted on them making a range of changes because things weren’t “up to scratch”. Absolutely not. I had and have no doubt so ever about any aspect of Kashrus in my parents’ home, where standard Australian Milk is and was used. 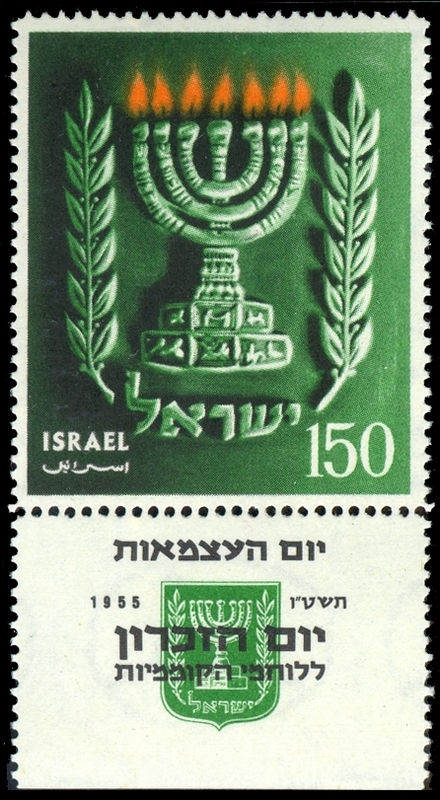 Rather, in those days, in the early eighties, there were a group of people who did not accept the permission of the famed Chazon Ish*, R’ Moshe Feinstein, and others, that Milk in the US, and countries like Australia can be assumed as “supervised” as a non-Jew would be loath to breach Government regulations and introduce non cow’s milk. In Australia, they are particularly strict, as any visitor to this country trying to bring in an apple will know. Accordingly, I approached my mother, and asked permission if she minded that we have one bottle of milk that is humanly supervised by an assumed reputable Mashgiach in the house. I told her that my motive was to be another person who bought such products, so that the nascent business which was trying to produce traditional Chalav Yisrael would survive. I was somewhat altruistic, and even agreed to support Hungarians 🙂 so that an alternative view could also exist from a business perspective by my small gesture. My mother accepted, and would make things Chalav Yisrael as she wanted me to be able to eat them, after I mentioned this. What started as an altruistic notion, was also expressed explicitly at the time, and even now, in terms of the fact that I do not consider, based on reliable world-renowned Poskim, the Government milk (Chalav HaCompanies) as any less Kosher. I did not take a blanket Neder (vow). As such, I never had or have a question of Keilim (vessels). I simply do not consider such vessels Treyf in any way or form. Unfortunately, come companies, such as Cadbury’s do use real milk, so the milk powder view mentioned above loses much value! In Israel the Rabbinate notes when overseas chocolates are made with Milk Powder. Enter Meir Gershon Rabi (MGR). He wants to produce Chalav that is supervised, using a web cam style supervision. The supposition is that in addition to Government regulation, one could “see” (although technically that can be faked easily enough) that its real milk from a Cow. Now, of course, as is well-known, MGR, runs a private BUSINESS from his Kashrus together with other investors. I would call them business entrepreneurs who use kashrut as their commodity. I have no doubt that MGR and his family did not rely on the Chazon Ish or R’ Moshe Feinstein, and instead bought the fresh Chalav Yisrael from Adass or the long life version. So, MGR announces that he has put into place a series of cameras for surveillance of a farm or two so that “more” confidence in the source of the milk can be ascertained. I assume he either considers this as more Mirtas or real Hashgocho. Whatever. I don’t understand the business model. People who are quite comfortable with the Chazon Ish and R’ Moshe Feinstein can buy any milk on the Kosher Australia app or web sites or publications. These are Kosher. They are not mehadrin according to those who don’t follow the Chazon Ish or R’ Moshe. Those who know, make their mind up. Presumably, MGR wants to increase the “confidence” in the mehadrin status of the milk through cameras. My prediction is that those who need a physical set of eyes via a Yotzeh V’Nichnas (surprise occasional visit from Mashgichim) or a full-time Mashgiach (who also examined the cans before milking—ask whether MGR’s web cams do that). Those people, and there are many, will not engage in MGR’s supervision of anything. They don’t eat from his Hashgacha anyway, and I’d love to know if MGR will now bring this new milk (which is used in this way in Israel but not accepted as mehadrin by the OU and others) into his own house for his own wife and children and grandchildren. The others who are happy with milk as listed in Kosher Australia don’t need to be bothered with his innovation. The milk in the Kosher Australia list is already deemed Kosher Milk. Why do they need MGR’s Camera Milk suddenly? Did he tell them they needed traditional Chalav Yisroel before his got his surveillance by video working? At the end of the day I am puzzled by this from a business perspective (although there is an initial outlay). Who are the potential buyers of such milk? MGR and his business partners must feel there is a new market? At the end of the day MGR’s business is a private company, and they will not allow the community to see their books or the money made from his Kashrus “innovations”. I just don’t get it. There seems to be no money in it! * There have been revisionists who claim the Chazon Ish wasn’t serious about his view. He most definitely was. The rest is the type of revisionism beautifully described by Marc Shapiro in his “Changing the Immutable” and documented with great precision by HaGaon R’ Dovid Segal. Author pitputimPosted on June 21, 2015 Categories KashrusTags It's not Kosher, Meir Rabi65 Comments on He’s really doing us a favour, truly altruistic! 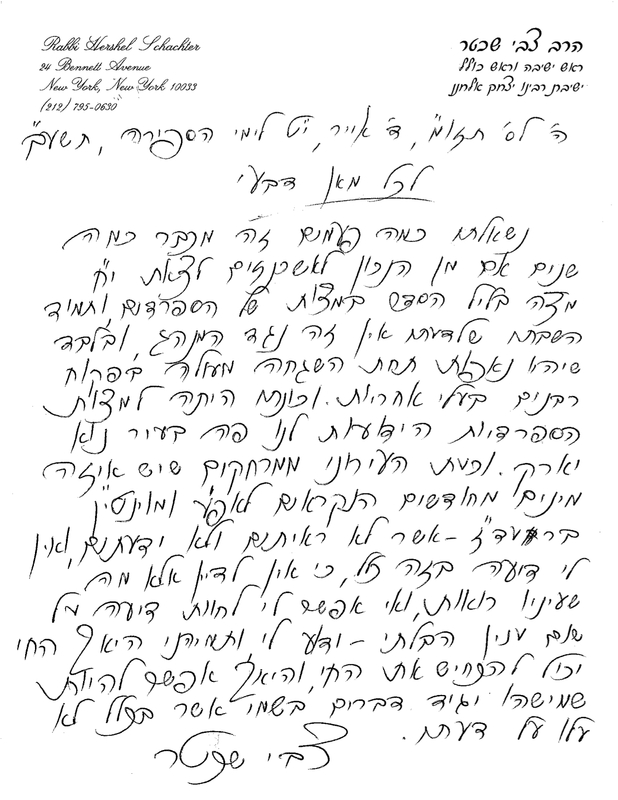 Fresh from his many years of strangulating a letter from Dayan Abraham for his benefit and refusing to take it down …. Over here in the USA I met Mori VRabbi Rav Schachter. I showed him a picture of the Machshir and business partner of ‘it’s not treyf’ a day after said Person had been to see him and asked permission to take the picture. Rav Schachter agreed provided it wouldn’t be used on his websites. So, what did he do? He went against Rav Schachter and did post the picture on his Facebook page. Splitting hooves again? How much chutzpah can one have? I was at a day long Yarchei Kalla at YU which was fantastic. The machshir is going around getting support for his Bnei Pekuah farm. I had to stop him using his picture as a Gravatar with Rav Belsky because It’s Gneivas Daas on my own blog. Why isn’t he in a picture with his mum and dad? Anyway, the frum oilom don’t use his hechsher and many who do are those who ….. The issue of gelatine and the view of R’ Chaim Ozer is well-known and as old as the hills. Sure, the Oilom Goilom think that someone has suddenly leaped to R’ Chaim Ozer’s defence and set him back up on the pedestal of decisor for all. Well, R’ Chaim Ozer was and remains so! On the issue of Gelatine from Cows (not Pigs) however R’ Chaim Ozer’s Psak was not accepted. So what next? You can expect Meir Rabi to scour every nash in order to ascertain that they definitely don’t use pig gelatine and then make a splash that the delicacy is now suddenly kosher after all. Well, the facts are that all major world-respected Kashrus authorities didn’t and don’t accept R’ Chaim Ozer’s Psak. Those of you who want to follow Meir Rabi and his company (they curiously claim a”community service”, heck, it’s a private profit making business making money out of declaring things kosher) go right ahead. For the rest of us, I suggest you read Rabbi Eli Gersten, here. A reader formally asked 7/11 in Melbourne about their slurpees. In Melbourne we have a reliable and respected kashrut authority where the finances are overseen by a lay body and a team of supervising Rabbis and applied chemists have no involvement or inducement via financial gain in regards what they approve or otherwise. This was not the case in the days of yore when various communal Rabonim provided their own hechsher and benefitted financially from the activities. I remember, for example, that strictly kosher people did not eat from the then Melbourne Beth Din or Rabbis Rudzki or Lubofsky et al. Many times I would buy a shawarma before a gig because I did not have confidence in the hashgacha. Nowadays, it’s almost never the case. Here is the readers response from the 7/11 people. I will leave my readers to draw their own conclusions. Unfortunately not all of the Slurpee flavours that we have are certified as Kosher, however we did receive an unprompted email out of the blue last week notifying us that kosher certification was awarded by “It’s kosher authority” for the following flavours this December. All I can add is that if Rabbi Rabi paskens according to his self-declared “placebo effect”, he certainly need not explain his decisions to anybody. I wonder if he’d pass this theory of Psak to the great Poskim of our generation for their הסכמה. I posted an article about Diet drinks on Pesach. The comments section was respectfully filled with important information from Rav Moshe Gutnick of NSW and others. I found myself eventually having to tone down some of the comments of interlocutors through editing. Rabbi Rabi of Kosher V’Yosher sent me a comment last night and it is not one that I can edit in the way that I wanted to. I would have removed the misleading Gravatar. Seemingly unable to find a picture of himself alone, Rabbi Rabi continues to use conjunctions of his image with a famous Posek (in this case Rav Belsky, may he have a Refuah Shelemah). In my opinion, this is G’neyvas D’aas as it may well constitute a transparent attempt to ascribe importance and respectability to his business and hechsher. It’s most unbecoming. I’m not going to be a mouthpiece for marketing of business/hechsherim. So, I’ll reproduce his comment below (lightly edited) without his gravatar and that’s the end of this issue for me unless I see written information either to his business/hechsher from Rabonim which contradicts the information that is issued by the Rabbinic Council of Victoria/NSW or if Rabbis from Victoria or NSW produce written information to them which contradict’s Rabi’s information. In our first year we did not have flour that was Shemurah from Ketzira, harvest, but only Shemurah from milling. An alert was placed upon the Matza packets of that year – suggesting that people use Matza that is Shemurah from Ketzirah for their Mitzva of Motzi Matza. There was no ambiguity that would lead any reasonable person to think that regular flour was used. If there is anyone who has a record indicating otherwise, I urge them to bring this immediately to my attention. Failing that, all remarks and those on this site saying/suggesting otherwise ought to be removed.In the same vein, quite a few postings here have been edited, the same courtesy and moral fibre dictates that all unsubstantiated remarks that reflect negatively upon my work and reputation should also be removed.A remarkable claim has been made, that HaRav Schachter rules that soft Matza may only be made by those with a Mesora; however, Rabbi Lebowitz has written that “I spoke to Rav Schachter about this several times. 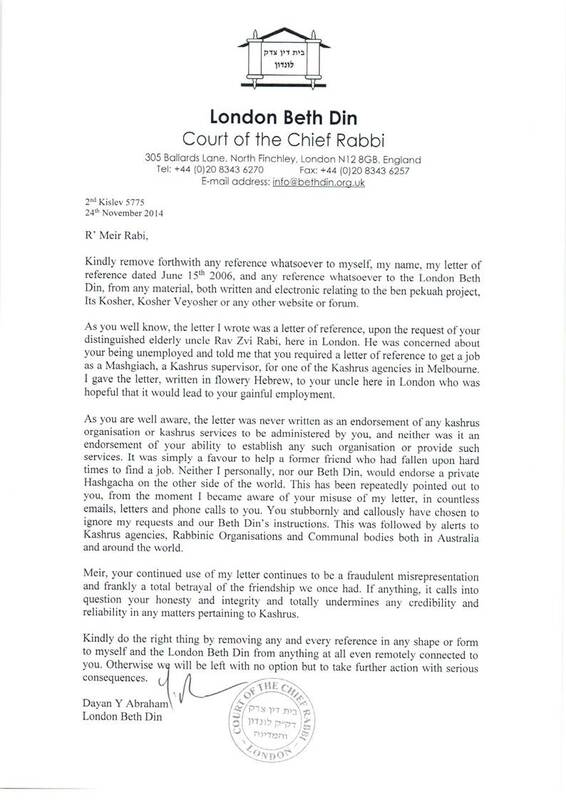 He holds it is completely permissible and has nothing to do with mesorah.” SEE full email http://www.realmatza.com/r-a-lebowitz-email.html Rabbi Moshe Gutnick emailed me that HaRav Schachter’s ruling can be found on the web. Can anyone assist me to locate this? We have not been able to locate it. some kosher good suppliers are making a fortune from profiteering on kashrus. Assuming the motives are earnest and with honourable intent, the line of argument used is rather straw man like. Yes, we would like to see all Kashrus under a central body. Yes, we like to see a collegiate Rabbinate and not isolated breakaways running their own kashrus supervisions/business. Yes, we would like to see the financial aspects of Kashrus provision (where relevant) under the financial supervision of a communal lay body. Yes, we would like to see Rabbis and Chemists and Mashgichim paid properly for their professional hard work. Yes, we would like to see shysters purporting to offer a kashrus service outed. 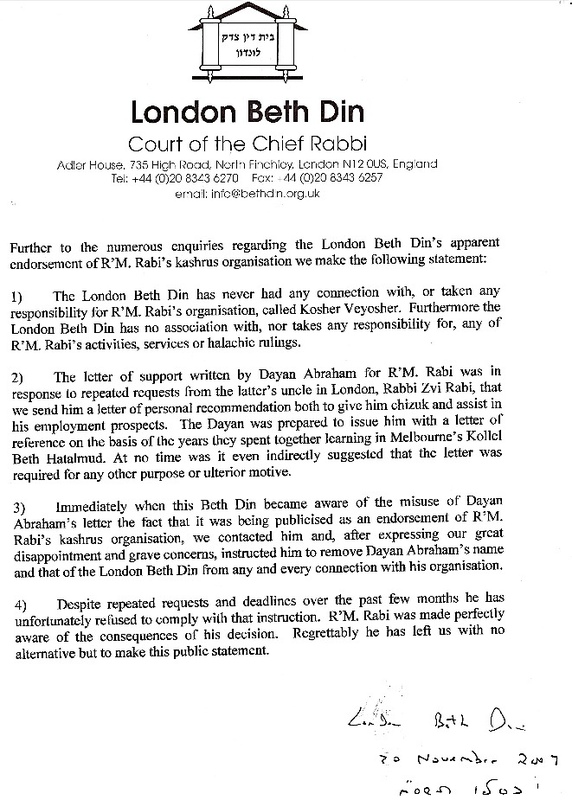 I assume my erstwhile colleague is serious about his concerns about the price of chickens and more, so I suggest that he invite Rabbis and owners to an independent Dayan. I’d recommend R’ Hershel Schachter. Vacillating on the internet is okay for musicians like me, but I’d suggest it isn’t a productive path for a Rabbi attempting to convince his colleagues through earnest debate. Some would say it’s a populist agenda like the socialists who put up “Viva La Revolution posters” near my office and all around RMIT. I don’t think they achieve much thereby.